According to the Government it is estimated that 62% of UK businesses are sole traders, but are they paying more tax than they need to be? This is not about tax avoidance schemes, this article is simply about looking at your business, your profits and your tax liability in order to determine whether you would be better to set up as a limited company rather than a sole trader. Not true, you can set up a limited company from as little as £12 by completing the forms on gov.uk. Of course, you do need to ensure everything is set up correctly and everything has been considered such as shareholdings etc. Once registered you must also register for Corporation Tax within 3 months. If you would prefer to get a professional to set up your limited company, we can offer this service free of charge to our retained clients. 2) Limited companies must be VAT registered. Again, this is not true. Only businesses with a turnover in excess of £85,000 must be registered for VAT. However, there are circumstances when being VAT registered is beneficial – especially if you deal with other VAT registered companies. This is something that we can explore with you and help weigh up the benefits versus the pitfalls. As I mentioned earlier, whether you operate as a sole trader or a limited company will very much depend on your individual business. That said, it is recommended that you spend some time looking into this carefully as the decision could have ramifications on your business and personal cash flow for years to come. The main thing to consider is the difference in how limited companies are taxed compared with sole traders. Individuals (sole traders, self-employed) are taxed based on your annual self-assessment filing and this covers both your business profits and other personal income. Everything over your tax-free allowance (typically £11,850 for 2018/2019) will be taxed at 20%, 40% and 45% depending on your income and you will also be required to make National Insurance Contributions. As a limited company you will pay Corporation Tax at 19% (for 2018/2019) on your business profits. 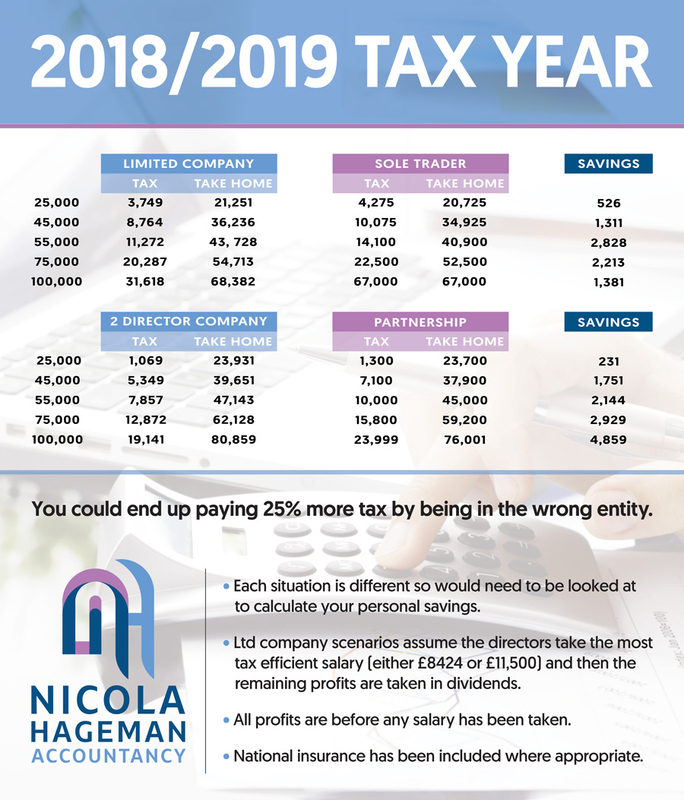 As a director of a limited company you can opt to pay yourself a small salary and take the rest of the profits as dividend payments. Dividend payments are taxed separately and are not subject to National Insurance Contributions. As well as the tax benefits there are also other areas to consider. Without doubt, being a sole trader involves a lot less paperwork and less reporting in to HMRC. But, if you can use a computer and have some time (or a great accountant) the benefits could far outweigh the investment. We never go into business anticipating the implications when things go wrong, but, if they do, it is reassuring to know that it will not impact you as a person. If something happens the maximum that can be claimed is that that is invested in the limited company and you will not be accountable personally for any debts or losses. 3) Selling or transferring a business. Should a shareholder or director pass away or wish to retire, transferring a limited business is easier than attempting to compile the assets and distribution of a non-registered business. This article has been written to give you an overview and some points to think about. As I said earlier in this article, the ramifications if you get this wrong can be far reaching so I would always recommend that you speak to your accountant. They can look at your wider financial landscape and help you make an informed decision. OK so that may sound quite scary but don’t worry, we are experts and will be on hand to set up everything from registering you as a limited company to dealing with salary and dividend payments – after all, you didn’t set up your business to spend hours on accounting paperwork. We offer a range of solutions to help you get the results you need, whether you require self-assessment support, payroll or bookkeeping services we can create a plan for you at a fixed monthly fee so there are no nasty surprises. For a small fixed monthly fee we can handle all the accounting aspects of your business accounts and all submissions as well as payroll for the director and director self-assessment return, accounting software and productivity tools. This package also includes tax investigation insurance to give you peace of mind that should HMRC wish to investigate your company accounts you have an accountant on hand to deal with the entire process with no additional fees to pay. This package starts at just £150 per month and allows clients to budget for accounting. If you are a sole trader thinking about becoming a limited company why not give us a call and we can chat through the options with you.